Handcrafted, nostalgic and very British. A few weeks ago, we took a call for what seemed to be a straightforward metal door canopy order. Nothing out of the ordinary, although our ears did prick up at the mention of a Chelsea garden. 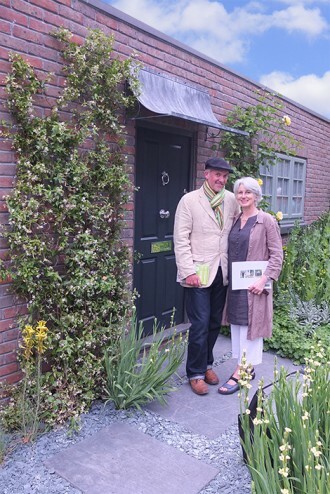 It was only last week, whilst glued to ‘possibly’ the greatest garden show on earth that we spied said zinc galvanised canopy in Sean Murray’s show garden on Main Avenue! Sean is a hard-grafting amateur gardener with a gardening style that evokes a grounding sense of history and place, richly adorned with nostalgic detailing. Sean recently won BBC2’s The Great Chelsea Garden Challenge and during the creation of his Chelsea finale garden was mentored by brilliant Cleve West. A British-made, hand crafted and heritage-inspired metalwork piece lends gravity to any building, here of new/old construction, evoking the themes ‘timeless’ and ‘long-lasting’. We love Sean’s take on weathering diverse materials, especially metal, something we also apply to our own creations. How inspiring too, to see a usually bare and uninviting car parking space given life and height with wildlife friendly plants, porous stones and recycled found objects, a practise we would encourage our own customers to do (including the support of some hard-wearing, made-to-measure metal garden trellis of course). It was therefore even more of a treat to go to RHS Chelsea 2015 (if this is possible) and see Sean’s garden in person on Saturday. We’d like to wish this now fully fledged garden designer the very best of luck with his new garden design company in the North East and hope to see more of Sean Murray at RHS Chelsea Flower Shows to come. We’ve also loved exhibiting Garden Requisites at Chelsea in the past and hope to do so again soon, so we can share our new, contemporary range of British wirework garden trellis structures, planters, porch covers, door canopies, window boxes (and now log burner fireguards!) with you all in person. Here’s to Chelsea 2015 and beyond!